Think killing "Will Kane" while riding a "Purple People Eater" on a cattle drive and you have my crazy image of singer, actor Sheb Wooley. This is more a memory than biography, but less biography than memory. I first saw Sheb Wooley on the screen at the Ritz Movie Theater in Van Nuys, California. Don't look for it as the Ritz was torn down decades ago to become part of the Civic Center. The theater ran old movies and I remember this was a Gary Cooper double bill of 1952's "High Noon" and 1951`s "Distant Drums". The year was either 1957, or 1958 but that means nothing here. Wooley was in both pictures, but it was in "High Noon" that he made an impression on me. 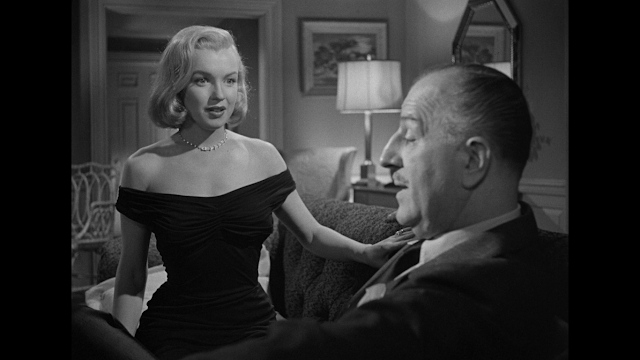 The film is a classic Western with allegorical political overtones related to Senator Joseph McCarthy and the House Committee on Un-American Activities. The motion picture was Produced by Stanley Kramer, Written by Carl Foreman and Directed by Fred Zinnemann. Zinnemann would always claims there was no political allegory in the picture, but audiences and critics thought otherwise. Carl Foreman moved to England before "High Noon" was released because neither Kramer, or Zinnemann would defend him before the House Committee On Un-American Activity on the phony charges of being a Communist. It was the time and not the truth that made many members of the Film Industry leave the United States after being "Black Listed", or afraid for themselves name names of those these good American's believed were Communist Party members. "High Noon" opens with three men coming together and then riding toward Hadleyville a small New Mexico town. As they ride the opening credits role and Tex Ritter sings the Academy Award winning ballad "High Noon" actually written under the tile "Do Not Forsake Me, Oh My Darling". 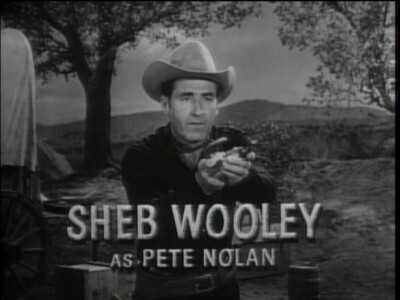 Sheb Wooley was one of the three men in this opening sequence. His character was Ben Miller the brother of Frank Miller, played by Ian McDonald, the killer just released from prison and coming to Hadleyville for the sole purpose of killing Gary Cooper's Marshall Will Kane, Kane had arrested Miller and the trial had sent him to prison. 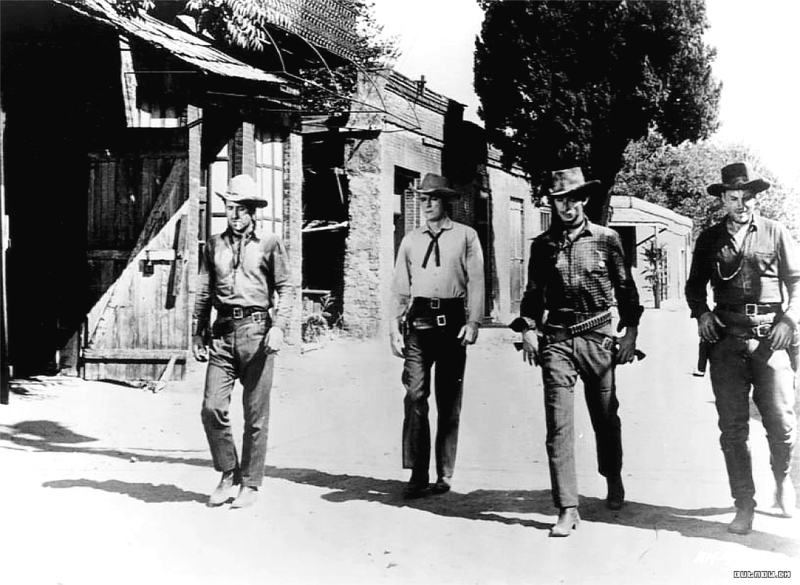 .The other two men in the opening were played by Robert J. Wilke as Jim Pierce and in his first motion picture appearance Lee Van Cleef as Jack Colby. Below Sheb Wooley's Ben Miller speaking to Robert J. Wilke's Jim Pierce. So who was Sheb Wooley and what does my opening paragraph actually mean? Shelby Frederick "Sheb" Wooley was born in Erick, Oklahoma on April 10, 1921 on his father and mother's farm. In High School the young Wooley had formed his first Country.Western Band. After High School he learned to ride while working at a local ranch and became a rodeo cowboy/ When the United States entered the Second World War the 20 year old attempted to enlist in the army, but was turned down as a result of his rodeo injuries. Sheb Wooley's return to singing and composing led to his own radio program for three years. In 1946 while working as a welder in the Houston, Texas oil industry Wooley married Edna Ethel Blunt. Sheb took an interest in his wife's nine year old cousin who wanted to be a singer.songwriter. He worked with the boy and bought up a fiddle. Edna's cousin's name was Roger Miller the future "King of the Road". After a while Sheb and Edna decided to move to California and as if in a Hollywood movie script. As the two crossed the intersection of Hollywood and Vine, for their first time, it was actually snowing. A very rare event in Los Angeles that I have experienced a few times over the years. On November 11, 1950 audiences saw Sheb Wooley in his first motion picture which naturally was a Western. "Rocky Mountain" starred Errol Flynn and Patrice Wymore. Tenth billing as Kay Rawkins went to the new actor. In the picture in his second screen appearance as "Plank of the Confederate States of America" was actor Slim Pickens. 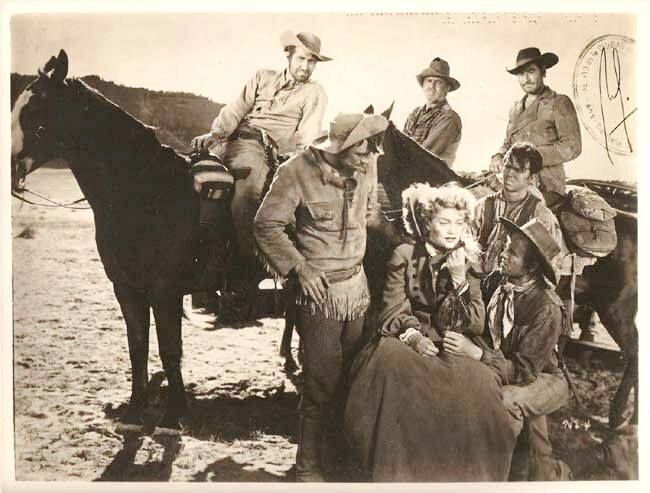 Sheb Wooley's true cowboy stance is very apparent compared to the other actors in this still from "Rocky Mountain" with Flynn, Wymore and Pickens. Two roles without on screen credit followed and then released on June 15, 1951 was a low budget Western about an army patrol sent to warn Custer entitled "Little Big Horn". The film from Robert L. Lippert ran out of money before it was completed and many pages were just torn out of the script to get it finished. It is actually very good and discovering the story about the script. I wish the entire screenplay had been shot, because this little character study does work very well on familiar territory. Another non-screen credited role followed "Little Big Horn", but even without that credit. Sheb Wooley was about to create a sound effect that would, in a round about way, make him famous in the motion picture industry. This occurred during the filming of the Gary Cooper movie "Distant Drums" released December 29, 1951. In the picture Wooley played Private Jessup just one of a U.S. Army patrol battling the Florida Everglades and the Seminole Indians. That name came from a character in the 1953 3-D Western "The Charge of Feather River" which was actually the third time it had been heard on film. The sound effect became extremely popular two decades later when motion picture sound designed Ben Burtt working for George Lucas discovered the effect in a can labeled "Man getting bit by an alligator". He used Sheb Wolley's scream first in a scene in the original version of "Star Wars" as Luke Skywalker shoots a Stormtrooper off a ledge. Burtt would use that effect in most of the other "Star Wars" films and "The Indiana Jones" pictures. As of this writing Wooley's scream has been used 359 known times. Two more roles including playing General George Armstrong Custer. Brings my reader to 1952's "High Noon". Where I began. Actually Wooley, Van Cleef and Wilke's roles are small. You see them riding into town, going to the train station and confirming the arrival of the train carrying Frank Miller at "High Noon". The train station clerk then leaves without being seen by the three men to find Marshall Will Kane, Kane is being married during this opening with most of the town there. Thus the story is set in motion and you really do not see the three characters again until Miller arrives for the picture's climax. Tension keeps building as the audience sees cuts to clocks showing the time moving closer to the noon of the title. The McCarthy allegory comes into play as Gary Cooper's Will Kane keeps finding no help from the towns people who were his friends against the killer Frank Miller. Instead of standing with the man who defended them for years they want him to leave town, because with Will Kane gone these upstanding townspeople believe they are safe from attack. Sheb Wooley, Robert J. Wilke and Lee Van Cleef were cast by director Fred Zinnemann for their looks alone and not to deliver dialogue. The three actors look dangerous and no words are necessary. In one scene as the four man walk the empty streets of Hadleyville, as all the townspeople are in hiding, Wooley's Ben Miller suddenly breaks a store front window to steal a women's fancy hat.Frank tells him there will be time enough later for what he has on his mind with Kane's new bride played by actress Grace Kelly. Wooley's sudden action and his facial expressions in the entire sequence more than any words give you the impression Ben is just north of psycho and a cold blooded killer. It's a very powerful and telling scene. 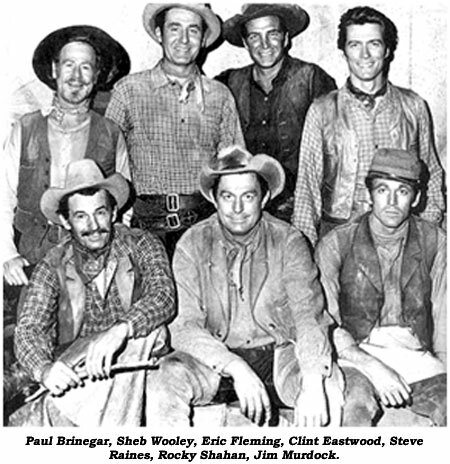 After "High Noon" Sheb Wooley started appearing on various Western television series that I was watching at the time. He was in two episodes of "The Cisco Kid", four episodes of "The Range Rider", seven episodes of "The Adventures of Kit Carson" and four episodes of "The Lone Ranger". Somehow the cowboy actor appeared in one episode of "Rocky Jones, Space Ranger" from May 1, 1954 entitled "Escape Into Space". Three of Wooley's movie appearances I saw included the Robert Mitchum, Susan Hayward rodeo western "The Lusty Men" released in 1952, the Kirk Douglas, Jeanne Crain, Claire Trevor "Man Without A Star" in 1955 and the following year the modern Texas set Elizabeth Taylor, Rock Hudson, James Dean picture "Giant". In 1957 Sheb Wooley was appearing only in single episodes of television's "Cheyenne", "Sugarfoot", "Maverick", "Tales of Wells Fargo" and "The Life and Legend of Wyatt Earp". So he decided to return to music and composed a few songs. In 1958 a little novelty song he wrote and sang stayed Number One on the Billboard Pop Charts from June 9th through July 14th. Like millions of American's 12 year old Lloyd was singing the lyrics of "The Purple People Eater" that included:. I said Mr Purple People Eater, what's your line? The above picture of Sheb Wooley in no way looks like the tough cowboy of "High Noon" and other Westerns he had appeared in up to 1958. In 1958 the actor/singer only had one on screen appearance in the Sterling Hayden western "Terror in a Texas Town" and the following years his scenes in Howard Hawks classic western "Rio Bravo" made it to the cutting room floor of the editors booth. 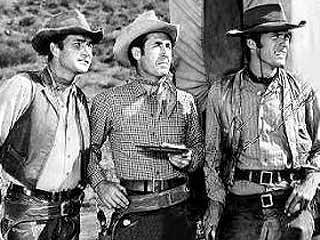 On January 9, 1959 Sheb Wooley first pprtrayed Cattle Drive Scout Pete Nolan in a new show on CBS. Over the next seven years he would be seen on "Rawhide" in 110 episodes of the program. Below Wooley's Pete Nolan in the middle of Eric Flemming's Trailboss Gil Favor and Clint Eastwood's Ramrod Rowdy Yates. In my opinion Sheb Wolley's Nolan stands out, because of the non-Hollywood look on his face. I don't know what the three are looking at, but only Sheb seems to think its serious. "Rawhide" was a favorite of mine and many others at the time. The show premiered at the height of the Western television craze. 1959 alone saw the premiers of "Laramie", "The Rebel" starring Nick Adams, "The Deputy" starring Henry Fonda, "Johnny Ringo", "Hotel de Paree", "Black Saddle", "Shotgun Slade", "Riverboat", "Wichita Town", "The Man from Blackhawk", "The Alaskans" with Roger Moore and the first color television program. A little thing called "Bonanza". Most of these Westerns I enjoyed in the evenings are long forgotten, but "Rawhide" possibly because of Clint Eastwood is not. Put "High Noon", "The Purple People Eater" and "Rawhide" together and you come up with my odd opening sentence: Think killing "Will Kane" while riding a "Purple People Eater" on a cattle drive. 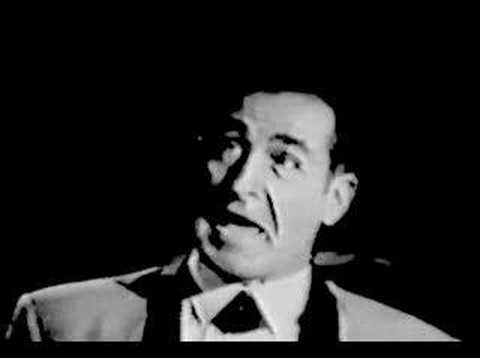 While he was working on "Rawhide" Sheb Wooley kept his singing career going. In Season 2, Episode 25, on April 22, 1960 the actor sang "Bury Me Not on the Lone Prairie" and in Episode 30, June 3, 1960 called"Incident of the Silent Web". Wooley sang "Jeanie with the Light Brown Hair". One of his own compositions "Hootenanny Hoot" became a Number One hit in 1963 not in the United States, but Australia. 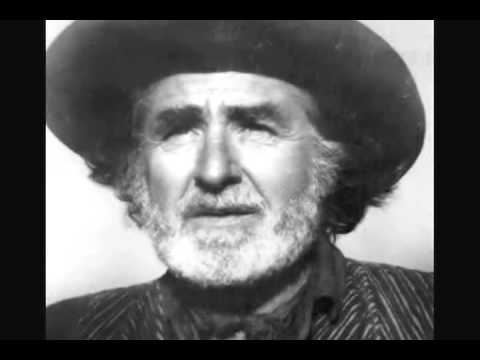 In 1969 Sheb Wooley became Ben Colder. A name he created from a 1962 song Sheb wrote about a boy from Alaska who had "never been colder". Wooley's Ben Colder would become a regular character on another CBS show "Hee Haw" which premiered June 15, 1969. As many American's associated him with his Colder personality. His real name disappeared as he started recording songs under his alternated personalities name. "Hee Haw" was considered a Country version of "Rowan and Martin's Laugh-In". Although most of those responsible for its creation and writing were from Canada. The program's regulars included Roy Clark, Buck Owens, Minnie Pearl and Tennessee Ernie Ford. A regular featured on the program was Bari Benton who was Hugh Heffner's partner at the time. Like "Laugh-In' the show contained several recurring sketches and characters. 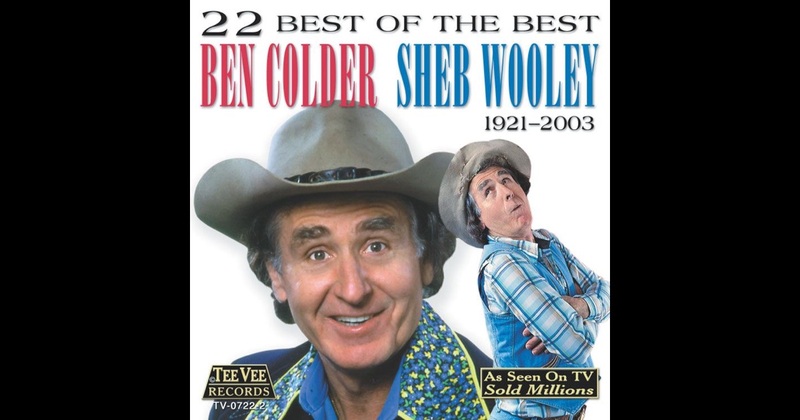 For the next 40 years Sheb Wooley continued to use the Ben Colder name to record singles and release albums to great success. One of his last novelty song hits was a parody of Billy Ray Cyrus "Achy Breaky Heart" called "Shaky Breakey Car". Sheb would appear between 1967 and 1988 in "The War Wagon", "The Outlaw Josey Wales", "Silverado" and of course a movie entitled "The Purple People Eater". Perhaps his best appearance was as Cletus Summers the principle of the High School that hires Gene Hackman in 1986's "Hoosiers". 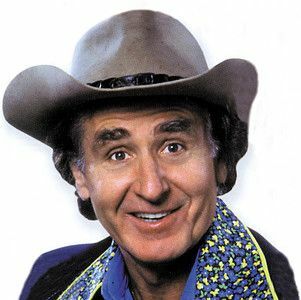 Three years later in 1989 at the age of 68 still a real cowboy Sheb Wooley was part of a six day Cattle Drive in Montana. The singer/actor passed away September 16, 2003 from Leukemia. From the moment I saw him in "High Noon" through his appearance in "Hoosiers" I have fond memories of Sheb.